Team England will include 75 athletes as part of the largest party they have ever sent to an overseas event for next year's Commonwealth Games in Australia. Heptathlete Katarina Johnson-Thompson, who was injured for Glasgow 2014, competes in her first Games. Long jumper Greg Rutherford is fit after being forced to miss this year's World Championships with ankle trouble. But CJ Ujah, who won the 100m Diamond League title, has decided to prioritise March's World Indoor Championships. Team England's Para-athletics team will be selected at the end of the year. Around 600 athletes and staff will represent the nation across 18 sports, including 38 para medal events, on Australia's Gold Coast. 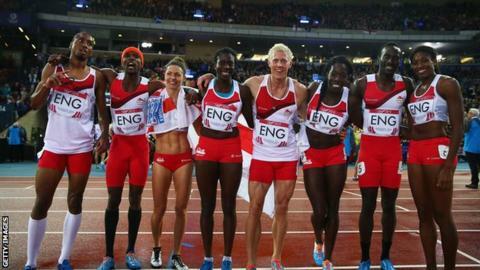 The athletics squad already boasts 18 Commonwealth medals and 46 Commonwealth Games appearances between them. Adam Gemili, who won silver in the 100m and 100m relay in Glasgow 2014, will spearhead the 100m challenge at the Games, which take place from 4 to 15 April 2018. "Winning two silver medals in Glasgow was an incredible experience for me and I'm really excited to get back out there," the 24-year-old said. British 100m and 200m record holder Dina Asher-Smith will lead the women's 200m bid and the 21-year-old from Kent said: "Having had an amazing experience at the Commonwealth Youth Games in 2011 I'm excited to be racing on that stage again. "I won two gold medals at that Youth Games so adding a senior medal on the Gold Coast is now the goal." Sarah Winckless, Chef de Mission for Commonwealth Games England, said: "We're putting forward some of the best athletes in the world and we're confident we will be sending the most prepared English team to Australia."